The Menu class in C# represents a WPF menu control. A menu item is represented by the MenuItem class. The code examples in this tutorial explain how to create menus in a WPF app and write menu item event handler to execute some code. Learn how to use menus in WPF app. In WPF, the Menu and the MenuItem classes represent a menu and a menu item respectively. A Menu is a collection of menu items with a command associated with each menu item. A menu item may have children menu items called submenus. 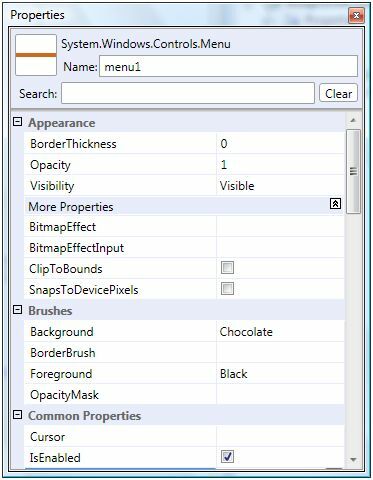 This article discusses how to work with menus in WPF applications using XAML and C#. The Menu element in XAML creates a menu control. The Name property defines the name of the menu and Height and Width represents the height and width of a menu control. To position a menu control in a Window, the Margin, HorizontalAlignment and VerticalAlignment properties may be used. The following code sets horizontal, vertical alignments, margin, and background color of a menu control. There are three ways to set menu control properties. You may use the Properties windows, set properties in XAML manually, or set properties at run-time using WPF code. If you right click on the menu control and select Properties menu item, you will see the Properties window same as Figure 1. As you can see from Figure 1, you can set all properties of a Menu control through this Window such as border thickness, opacity, bitmap effects, background and foreground colors, alignments, width and height, layouts, and fonts. Once you set properties in the Properties window, the respective XAML code is written in the XAML file by the designer. For example, I set BorderThickness to 2, BitmapEffect to DropShadowEffect, and Background to Blue as shown in Figure 2. 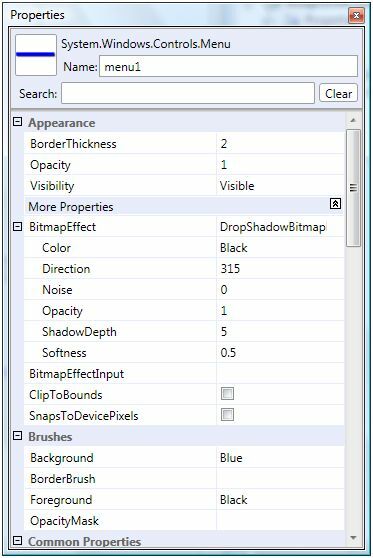 If you look at the XAML file now, you will see Menu code like below where you can see BorderThickness is set to 2, Background is set to Blue, and Menu.BitmapEffect element is added within the Menu element. Now, the menu looks like Figure 3. Now let's add menu items and sub menus to the menu control. The MenuItem element adds a menu item to the menu control. The following code shows the initial syntax of the MenuItem element. The Header attribute is the name of the MenuItem. A MenuItem can have other MenuItem elements within it as child/sub menus and can go up to several levels. The following code adds three children menu items to first menu item. The output looks like Figure 4. A separate is used to separate categories of menu items. We can add a separator to a menu control by using <Separator /> element. We can also add sub menus and sub menu items using the MenuItem element within parent a MenuItem element. 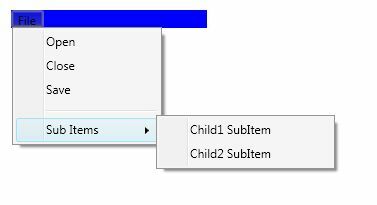 The following code adds a separator and sub menus and sub menu items to the menu. Now, our new output looks like Figure 5. The MenuItem.ToolTip element adds a tooltip to a menu item. The following code adds a tooltip to the Open menu item. The output with the tooltip looks like Figure 6. By setting IsCheckable property of a MenuItem to true makes a menu item a CheckBox in front of the header text. InputGestureText property is used to add keyboard shortcut to the menu item. The following code adds CTRL+O to a menu item. You can also add ALT support to a menu item by adding underscore (_) before a character and ALT+character will work. For example, in the previous line of code, _Open menu item can be executed using ALT+O. The Click event is used to add the menu item click event handler. The following code adds a click event handler for a menu item. The event handler is defined like following in the code behind. I added a message box when the menu item is clicked. The following code creates a menu and adds menu items dynamically. How about creating a nice gradient background of menu as in Figure 8. All we need is to set the Background of the Menu item to LinearGradientBrush. Let's say you need to add menu items horizontally, not vertically. All you need to do is, create your Menu width so all items will fit. And you can set layout of the Grid. One of the readers how to set the MenuItem background to an Image. We can do this by setting the Background property of the MenuItem to an ImageBrush. The ImageBrush takes ImageSource as the full path of an image and we can also set the Stretch property to Fill. 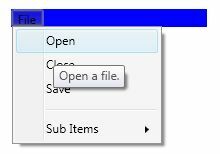 How to add an Image to a WPF Menu Item. This code adds an icon image in front of the menu item header text. In this article, I discussed how we can use Menu and MenuItem controls to create menus in a WPF application.We also saw how we can set menu properties, add menu items at design-time as well as at run-time and add menu item event handlers.